I’ll be tuning in for more examples of exquisite trash and sharing what I find from this and other blogs. Of course, with friends also combing the Web and the world, this job becomes much easier. Big ups to my tipsters, keep the trashy content coming! This entry was posted on Monday, October 13, 2008 at 11:55 pm and is filed under Artistic Trash, Garblogging. You can follow any responses to this entry through the RSS 2.0 feed. You can leave a response, or trackback from your own site. No, big ups to you for having a trash blog. I have seen a few of those “trash cars” around town, especially when I lived in Albuquerque. Just a lot of eccentric people there. 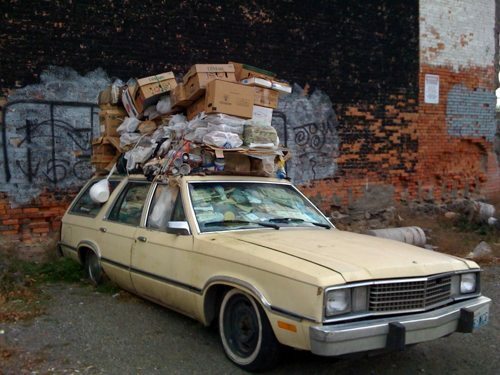 People with trash cars are compulsive hoarders obviously. My old documentary on dumpster diving will be online this weekend and you can see more of that kind of thing in it. I’ll hook you up with a link.